A two-wheeled electric commuter concept designed by young Australian designers at GM Holden could morph into a production vehicle that will cruise without driver input through city traffic snarls in China. The Port Melbourne-designed two-seater Xiao EN-V (Electric Networked-Vehicle) was one of three EV passenger ‘pods’ revealed ahead of the 2010 World Expo in Shanghai last May, when General Motors and its Chinese partner Shanghai Automotive Industry Corp (SAIC) revealed their vision for sustainable urban transportation in the year 2030. Now, GM China has announced it will develop a next-generation EN-V to take part in real-world testing on public roads in China, as part of a memorandum of understanding it signed on April 17 with the Sino-Singapore Tianjin Eco-City Investment and Development Co Ltd (SSTEC). As part of the agreement, GM will initiate a feasibility study to incorporate a ‘mobility internet’ into transport infrastructure to support vehicles like the EN-V.
GM China Group chief and former Holden executive, Australian Kevin Wale, said at today’s Shanghai motor show opening that GM has reached a preliminary agreement with the SSTEC to conduct joint-research to directly address urban congestion concerns being expressed in major cities. “At World Expo 2010 Shanghai, GM demonstrated our vision of sustainable urban mobility and published the GM Sustainable Urban Mobility Blue Paper at the conclusion of the event as a call for action and a roadmap to the future,” said Mr Wale. The is no guarantee that Holden Design’s “nautically inspired” version of the EN-V - which translates to ‘laugh’ in Chinese and is a “light-hearted” Aussie design that looks like a deep-sea diving suit – will reach production. 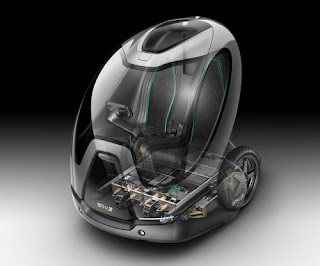 But it has as much chance as the Jiao (pride) EN-V designed by GM Europe and the Californian-designed Miao (magic), which will also ride on a next-generation Segway platform that balances on two wheels powered by two electric motors and a lithium-ion battery. Either way, Holden says it is chuffed that its most daring design to date could go to the next level in the production process. “Obviously from a Holden perspective, it’s pleasing to see the hard work and creative vision that our advanced design team put into the original concept rewarded with this next step in the program,” said spokesman Jonathan Rose. While the three advanced GM EN-Vs took pride of place at the SAIC-GM Pavilion a year ago, this week Mr Wale announced an ambitious five-year business plan in which he said GM would take further steps to bring its vision of a world without petroleum, vehicle emissions, accidents and traffic congestion to life. Mr Wale also announced GM would introduce 60 new or upgraded models and achieve EV leadership in China in the next five years as part of its drive to double sales to about five million vehicles in its largest single market and the world’s most populous nation by 2015. This week’s GM-SSTEC MOU aims to collaborate on plans to integrate next-generation EN-Vs in Tianjin Eco-City from a power, communications and physical infrastructure perspective. GM says that by combining GPS with vehicle-to-vehicle communications and distance-sensing technologies, compact EN-Vs - which can be driven both manually and autonomously – can offer greater manoeuvrability and safety in areas with limited space. “SSTEC is committed to building a practical and sustainable Eco-City, which includes having a comprehensive and integrated green transport system,” said Ho Tong Yen, the CEO of SSTEC, the master developer for the Tianjin Eco-City, a landmark joint-venture project between China and Singapore with private-sector investment. Spanning 30 square kilometers, the Tianjin Eco-City is located 40km from Tianjin’s city centre. Designed to be “a harmonious and sustainable community that meets the needs of an urbanising China”, it will initially house a 4sq-km start-up area with as many as 26,500 households. Providing a glimpse into a future in which 60 per cent of the world’s population of eight billion will be living in mega-cities around the globe, the eco-city will eventually become a modern township in which 350,000 residents will live, work and play, with first residents expected to move in next year. 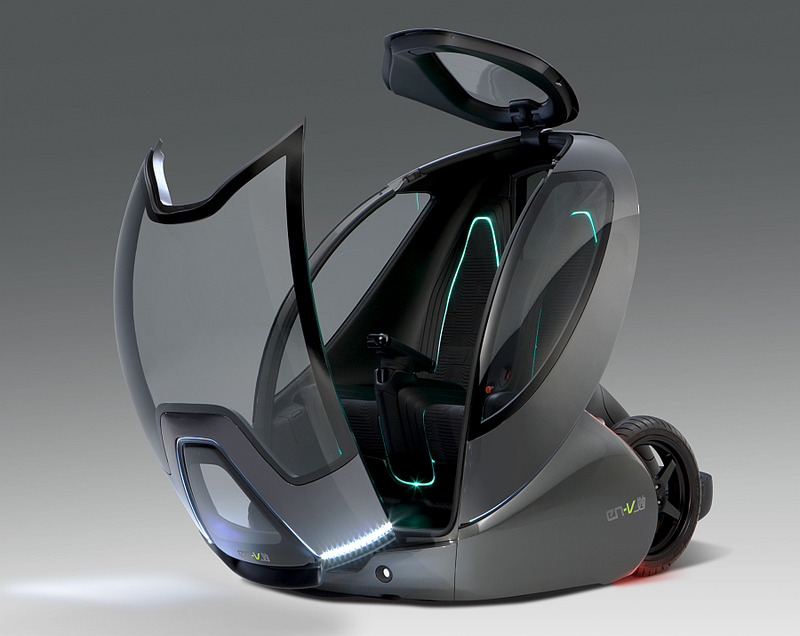 “Since its global introduction at World Expo 2010 Shanghai, the first-generation EN-V has travelled the world and received attention from global leaders, academics and environmentalists,” said the vice-president of GM’s Global Research and Development Organisation, Alan Taub. Unlike the original Segway, which was controlled by the rider leaning in the direction of travel, the new EN-V automatically keeps it balance while being driven by drive-by-wire controls for up to 40km at a top speed of 40km/h. As we’ve reported, the 500kg Xiao EN-V, four of which can occupy the space of a conventional small car, was developed over 15 months by a team of young Holdne designers overseen Holden design director Tony Stolfo, design manager Aaron Deneweth and lead designer Frank Rudolph.